Denny Jump (Bellevue, WA, United States) on 22 July 2011 in Landscape & Rural. Now we return to Acadia National Park during A very short visit that Barbara and I made back in September of 2009 . I was not extremely happy with most of my images from this short trip because the vast majority of them were shot facing the wrong direction (duhhh) i.e. into the glare of the mid-day and afternoon sun. But one does what one can with the time and tools that he has. So, I shall try to find a few other shots that might not be half bad and put them up here. Today's image we are looking off towrds Mt Deset Island to the East-Northeast of the main part of the Park. The rugged coastline and granite are magnificent elements along this coastline. I hope you enjoy! A lovely spot you found here. The trees nice frame the scene. @Steve Rice: Hi Steve -Thank you so much...it was mid-day by the time we got up here but we still loved the view!! I'd like to visit right now! Lovely area, lovely shot. @Richard: Thank you Richard..I agree wholeheartedly...Barbara and I have been talking about going back for 2 years now...we did not have enough time on the first visit and we were exhausted when we arrived so that took away some of our energy..It is so beautiful! Good vantage point, Denny. The warm light creates a great view of the rocky peninsula. Certainly looks to be a beautiful and wild place. @Stephen: Hi Stephen - Thank you so much. I am in awe of your image today - just magnificent, my friend! @Eric Cousineau: Thank you so much, Eric...it even rivals the west coast doesn't it?? wow - breathtaking view - I can almost feel the warm breeze on my face. I have never visited Acadia NP, but from your shot, I would like to see it. I have always wanted to visit there. This is a gorgeous view. @Elaine Hancock: Thank you Elaine - it truly is beautiful!! This is so beautiful. I love the wide expanse and perspective. This looks like a beautiful serene place. A mini vacation for me! I'm exicted. Visited there once in pre-digital days, and have often thought about going back to stay longer and really absorb the scenery and culture. Can't wait to see more of your pix. Beautiful scenery and great view, I like how you framed the shot with the green foliage! Stay cool today! @RBL: Thanks Ruithie...39C /102F here in CLinton, NJ where I work!! WHEW! A beautiful panoramic vista that you've captured here! I love how the landscape "envelopes" the water. @Steven: Hi Steven - Thank you very much ;-) I really loved your shot for today - what a beautiful angle and view you had!! 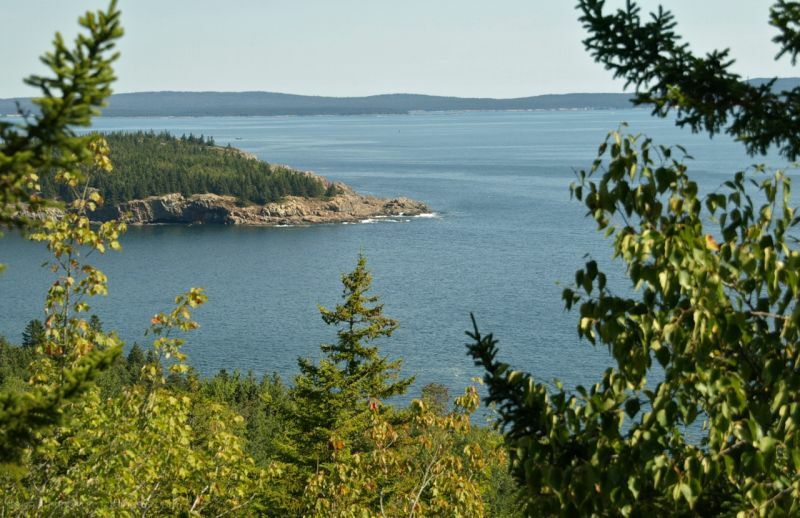 Acadia NP is such a beautiful place, and you've captured a great shot here. When I think of the Maine coastline, I think of the Thomas' English Muffins ad's "nooks & crannies". The main problem is finding a safe place to pull over for photos. I guess that's true of many coastline areas. the highest point to get this one. @Phil David Morris 2011: Well thanks Phil - we actually DID have to hike up to this poit on 546bft Gorham Mtn...not all that high by West Coast standards but formidable in the east...thanks again Phil! beautiful and tranquil scene. I finally got a chance to see the Dee Dee Bridgewater photo you suggested, it looks like it was a great show. Seeing Acadia NP is on my bucket list. Just having left Maine, I will concede that it is beautiful, but I must admit that I feel most at home in the Rockies and the Sierra Nevada.